← Does anybody in Malaysia know anything? My favourite place in Kuala Lumpur, besides the food stalls, is the Batu Caves. It’s a fun way to spend some time close to the city if you’re tired of sightseeing fancy malls, big shiny buildings, and traffic jams. It’s super easy to get to. You can catch a train from the Pasar Seni station by chinatown, or hop on one at KL Sentral. It’s only about a twenty minute ride until you arrive to the final stop on the route. If you have ever been to the limestone cliffs in southern Thailand or Halong Bay in Vietnam, you will have flashes of deja vu. Though still in the city, it feels like you’ve left it all behind. A complex of caves, it’s one of the most popular Hindu shrines outside of India and gets it’s name from the Batu River, which flows nearby. The shrines and man made parts were built in 1891. 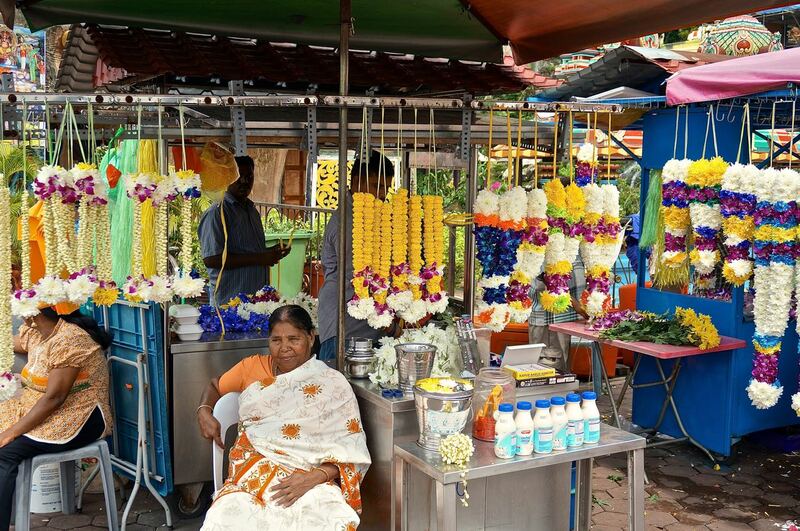 Around the bottom are many people selling snacks, souvenirs, and beautiful move flower necklaces. At the base of the hill are two caves full of Hindu statues and paintings. It takes hiking up 272 concrete steps to reach the entrance of the main cave (cathedral cave or temple cave). At the bottom stands the worlds tallest statue of the hindu deity Murugan at 140 feet, which took three years to build and 24 million rupees. Along the way up are super sneaky Macaque monkeys. 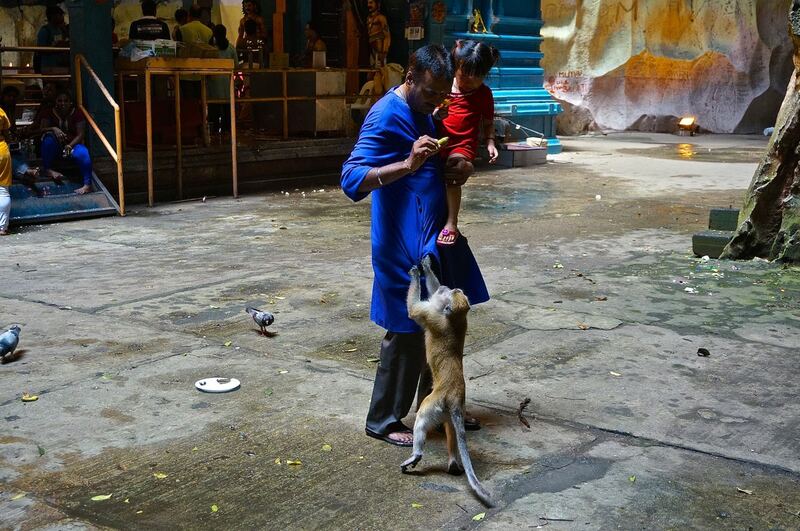 There are some signs saying not to feed the monkeys, but at the bottom there are people selling bananas to feed them. If you bring any food with you they will most likely be eating it before you leave. I saw one swoop in and steal a bottle of milk from a two year old leaving him crying. A few others used power in numbers and robbed a guy for his lunch then sit and rip it apart inhaling mouthfuls of rice. There were a lot of moms jumping around with brand new little babies grasping to their undersides. I could be entertained by monkeys for days. It’s creepy looking into their eyes and much different than looking into animals eyes. You can see that there’s a lot going on in their brain and almost feel on the same level in a way. When I was there they were celebrating the 125th anniversary with ceremonies and offerings. A lot of the babies and young kids had a sandalwood paste applied on their shaved heads, which is common in a lot of different Hindu rites. The hindu religion is so colourful and elaborate. From the beautifully arranged fruit plate offerings to the intricately decorated shrines. When you add in a bunch of incense smoke, a smorgasbord of aromas, and loud blaring hindi music, it turns into an amazing experience. Everyone there was so friendly and open to talk about what was going on. I even ended up with an indian family at one point. They have no problem just handing a baby over to you. I could have zoned out on everything going on for hours. At the back of the cave theres a bunch more monkey business going on. I learned one thing back there, monkeys are awesome rock climbers. The little buggers could zing right up a vertical rock face in seconds flat. They would do rounds of coming down to check everyone out and then run back up the rocks. One bully came down and practically crawled up a guy to steal his food. Sneaky monkeys. This entry was posted in Malaysia travel, Photography, travel and tagged batucaves, ceremonies, culture, hindu shrines, kuala lumpur, macaque, malaysia photography, monkeys, murugan, statues. Bookmark the permalink.